An icon is a graphic that takes up a small portion of screen real estate and provides a quick, intuitive representation of an action, a status, or an app. So, Icons should get people’s attention and can be much more efficient than words. Create and manage Icon sets for multiple densities to provide Icons in such a way that they will be displayed optimally on any device, regardless of the device’s screen size or resolution. Android Icons should be 32-bit PNGs with an alpha channel for transparency. The finished Icons dimensions corresponding to a given generalized screen density, are shown in the table below. Table 1. Summary of finished Icons dimensions for each generalized screen density. Let’s talk about detailed guidelines for the common types of icons used throughout Android applications. You can read where each types of icons are used in our previous post Android App Icon Sizes (3.0). Table 2. Summary of Icons informations. Launcher Icons Launcher icons on a mobile device must be 48×48 dp.Launcher icons for display on Google Play must be 512×512 pixels. Full asset, 48×48 dp Use a distinct silhouette. Three-dimensional, front view, with a slight perspective as if viewed from above, so that users perceive some depth. Small / Contextual Icons Small icons should be 16×16 dp. 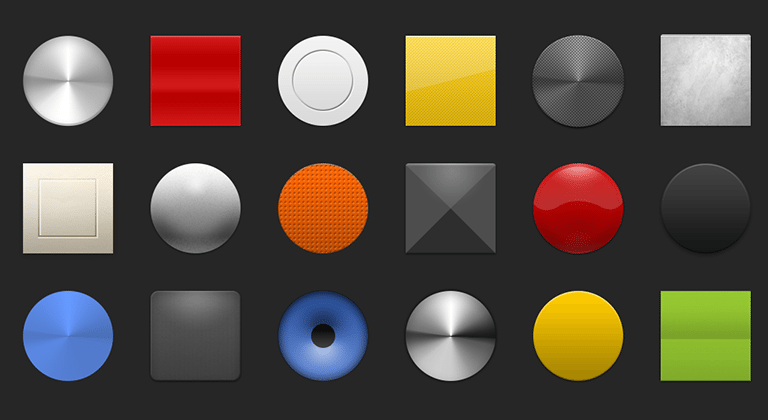 Full asset, 16×16 dpOptical square, 12×12 dp Neutral, flat, and simple. Filled shapes are easier to see than thin strokes. Use a single visual metaphor so that a user can easily recognize and understand its purpose. Use non-neutral colors sparingly and with purpose. For example, Gmail uses yellow in the star icon to indicate a bookmarked message. If an icon is actionable, choose a color that contrasts well with the background. Notification Icons Notification icons must be 24×24 dp. Full asset, 24×24 dpOptical square, 22×22 dp Keep the style flat and simple, using the same single, visual metaphor as your launcher icon. Notification icons must be entirely white. Also, the system may scale down and/or darken the icons. Use vector shapes where possible. When possible, use vector shapes so that if the need arises, assets can be scaled up without loss of detail and edge crispness. Using vectors also makes it easy to align edges and corners to pixel boundaries at smaller resolutions. Start with large artboards. Because you will need to create assets for different screen densities, it is best to start your icon designs on large artboards with dimensions that are multiples of the target icon sizes. When scaling, redraw bitmap layers as needed. If you scaled an image up from a bitmap layer, rather than from a vector layer, those layers will need to be redrawn manually to appear crisp at higher densities. When saving image assets, remove unnecessary metadata. Although the Android SDK tools will automatically compress PNGs when packaging application resources into the application binary, a good practice is to remove unnecessary headers and metadata from your PNG assets. Tools such as OptiPNG or Pngcrush can ensure that this metadata is removed and that your image asset file sizes are optimized. Make sure that corresponding assets for different densities use the same file names. Corresponding icon asset files for each density must use the same file name, but be stored in density-specific resource directories. This allows the system to look up and load the proper resource according to the screen characteristics of the device. For this reason, make sure that the set of assets in each directory is consistent and that the files do not use density-specific suffixes. The Android Icon Templates Pack is a collection of template designs, textures, and layer styles that make it easier for you to create icons that conform to the guidelines. The icon templates are provided in the Adobe Photoshop filye format (.psd), which preserves the layers and design treatments that used when creating the standard icons for the Android platform. Action bar icons are graphic buttons that represent the most important actions people can take within your app. The download package includes icons that are scaled for various screen densities and suitable for use with the Holo Light and Holo Dark themes. The package also includes unstyled icons that you can modify to match your theme, plus source files. Use color primarily for emphasis. Choose colors that fit with your brand and provide good contrast between visual components. 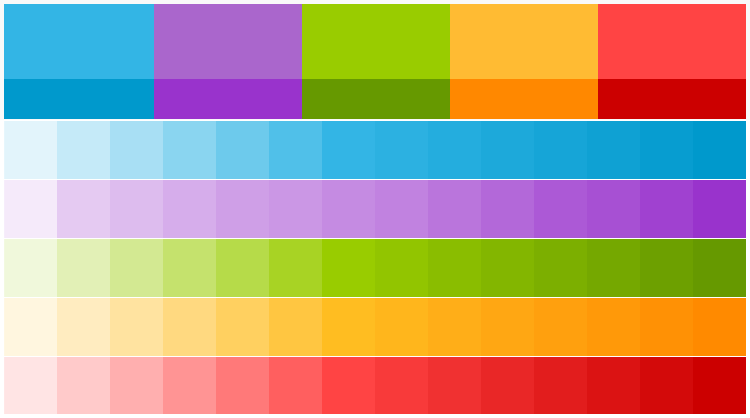 Blue is the standard accent color in Android’s color palette. Each color has a corresponding darker shade that can be used as a complement when needed.